Plans for the SDSU Downtown Gallery began in the summer of 2003 when the School of Art, Design, and Art History opened a temporary exhibition space in San Diego’s Gaslamp Quarter at 232 Fifth Avenue. Its success prompted a collaboration between the Center City Development Corporation and the School, with the goal of locating a permanent site for an off-campus gallery. Through this collaboration and the generosity of Bosa Development Corporation, in 2010 the SDSU Downtown Gallery opened to the public in a dedicated space on the ground floor of the Electra Building. Foot of Market, 1910. ©San Diego Historical Society. The historic narrative of the SDSU Downtown Gallery begins in 1911, when transportation in downtown San Diego was a mix of horse-drawn, gasoline-driven, and electric vehicles. During this year, John D. Spreckels finished construction on a power-generating plant for his San Diego Electric Railway Company, located at the northwest corner of Kettner Boulevard and E Street. 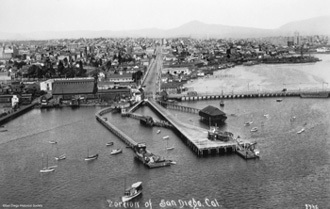 Throughout its seventy-two-year history, Station B remained the primary energy-generating source for the city of San Diego. After closing its doors in 1983, Station B lay abandoned for the next twenty years before being resuscitated through redevelopment and preservation. When the power plant began operation, the population in San Diego County was approximately 61,665, with the San Diego Electric Railway served 9,885 customers; by 1920, when the company was bought by San Diego Consolidated Gas and Electric Company, the population in San Diego had soared to 112,248 and San Diego Consolidated customer base was now 30,983 customers. Following the sale, the building became known as Station B. Over the next twenty years, it would undergo four architectural additions and numerous upgrades to its power generating capabilities. While Station B provided energy for the citizens of San Diego, the building itself contributed to the region’s historical architectural significance through the work of Eugene Maximillian Hoffman (1870-1948) and William Templeton Johnson (1877-1957). The work of Hoffman and Johnson situate the Electra Building and the SDSU Downtown Gallery in the middle of San Diego’s architectural history, linking the Gallery to significant architectural designs and developments within the city. 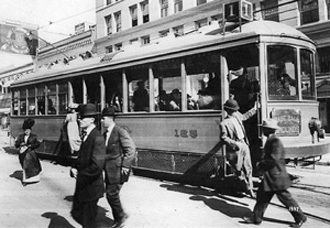 Car 125, Line 1, c. 1915. ©San Diego Historical Society. The original Station B facility was designed by Eugene Hoffman and located on the southern half of the city block. While many of Hoffman’s later architectural commissions were created in the Spanish Revival style, he used classical motifs for Station B, such as rounded arches, recessed coffered details on the exterior walls, and the original 1911 pediment that can still be seen on Kettner Boulevard. 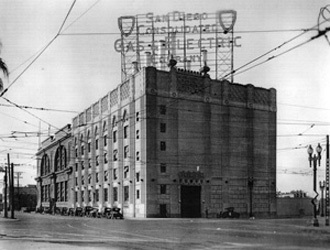 San Diego Gas and Electric, Station B, at Kettner and Broadway, c. 1929. ©San Diego Historical Society. In 1928, seventeen years after Hoffman’s design for the Station B plant was achieved, William Templeton Johnson designed a new wing for the building. Once completed, this addition occupied the entire block north of the Hoffman building, from Kettner Boulevard on the east to the train tracks on the west. The first half of Johnson’s design was completed in 1928 while the second half was not constructed until 1939, due to the onset of the Great Depression. It is in Johnson’s north wing that the SDSU Downtown Gallery is located. Johnson is known primarily for his Spanish Revival architectural designs, which can be seen throughout the Station B power plant, particularly in the ornamental frieze running across the top-most portion of the building, and in the distinctive sets of wooden doors on the north façade. However, Johnson’s design is transitional, as the ornamentation of Spanish Revival gives way to an emphasis on verticality, indicative of the Art Deco style, complementing the strong classical lines of the Hoffman design. Nearly one century after ground was broken on the Station B power plant, the historic structure has been renewed from a building that generated power with turbines and power lines to a space whose energy and innovation comes from SDSU students and faculty, artists, and the community. We will be closed for a special event from 11am - 4pm. We will be open in the evening from 5:00 p.m. - 8:00 p.m.